The Varnish, the jewel in the 213 downtown crown, will be hosting a New Year's Eve party for $125 (tip included). The party will go from 9 pm - 2 am and includes the Varnish's classic handcrafted cocktails, unlimited servings of Bols Genever punch and a Midnight champagne toast. Varnish hostess/server Rebekka Johnson's comedy band, the Apple Sisters will lead a countdown to 2011, which will conclude with a champagne toast. A twist contest is promised, so be sure to wear your dancing shoes. Reservations can be made for parties of 2, 4 or 6. The Varnish is quite small, so reserve early or miss out. La Descarga is pulling out all the stops for their first New Year's Eve celebration. Tickets are $150 for the black tie event at which attendees will be dressing to impress as if they were in Havana 100 years ago. The all inclusive tickets include hors d'oeuvre, live entertainment, open bar, champagne toast at midnight and dancing. If you have been to La Descarga on a regular night, you know the quality of the entertainment. I've been told that they are kicking it up a notch for this celebration. 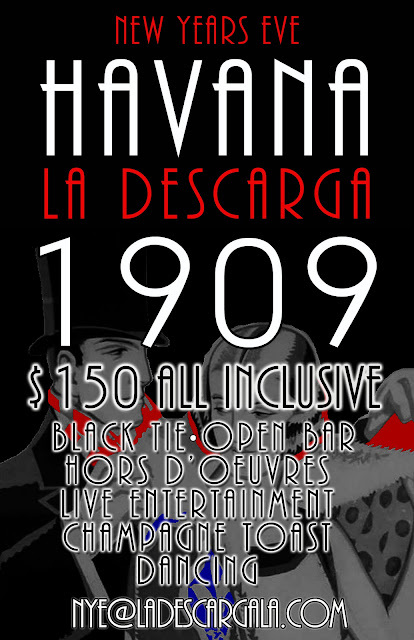 La Descarga has some of the highest quality drinks in town, so open bar will be quite a treat. The great sounds of Cuban music by the live band will be sure get you dancing. I have been told that this event is almost sold out, so get your tickets or miss out til next year. If you can't make up your mind so want the smorgasboard approach to New Years, then the New Years Eve in Downtown LA is for you. A single $119 ticket entitles you to open bar at eight different downtown watering holes, including Cana Rum Bar, Casey's, Seven Grand, the Golden Gopher, Cole's, Las Perlas, Tony's Saloon and Broadway Bar. At Casey's, the band Gram Rabbit will be performing live and well spirits and 11 craft beers are included in the open bar. Cole's will be offering champagne cocktails and the Cole's classic cocktails all evening. Cana Rum Bar will be serving daiquiris and their signature cocktails to the beat of a band performing Gypsy Jazz. Paul Chesne of the Paul Chesne Band will be performing at Tony's Saloon. The $50 price for the New Year's Eve open bar party goes up to $75 on December 28th, so book early. Why pay more to be a procrastinator?